77.2% of people surveyed in the UK agree that ‘supermarkets should stop selling drinks in plastic bottles’. 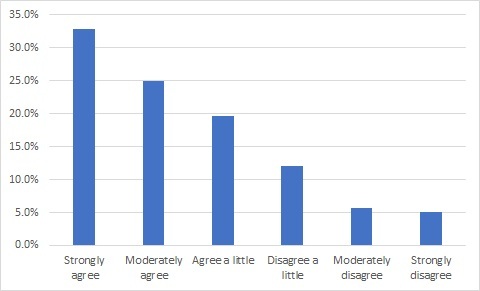 32.8% agreed ‘strongly’ when given six options (strongly/ moderately/ slightly, agree or disagree) in a survey of 1001 people fielded for CDSM (Cultural Dynamics Strategy and Marketing) in February. 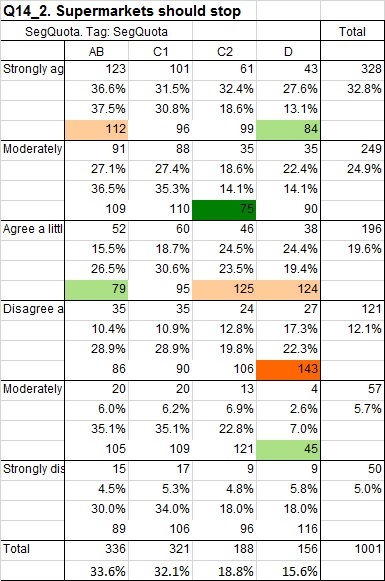 (The same survey also asked about a phase-out of plastic except for essential uses: 84% agreed, 39% ‘strongly’ so). 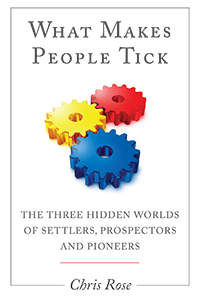 At a Maslow Group level (Settlers, Prospectors, Pioneers), the Pioneers were significantly (16% index) more likely than the population average to ‘strongly agree’, which is a skew typical of a ‘breaking issue’ and one where campaigns are already being run (against ‘Single Use Plastic’ of which plastic bottles are one of the most obvious uses). 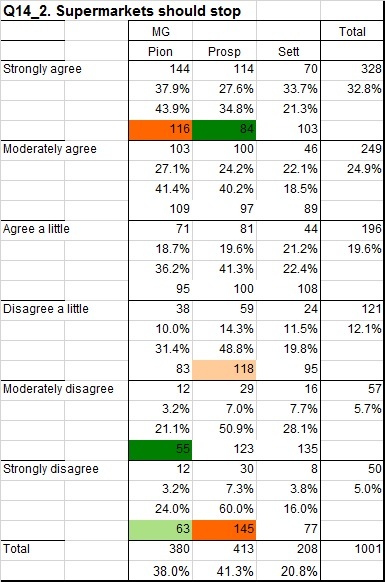 However there is an across-the-board preference among all three main values groups to support a ban. Pioneers are the group with highest self-agency and most likely to first adopt new behaviours such as giving up single-use plastic bottles in favour of other options such as refillables. 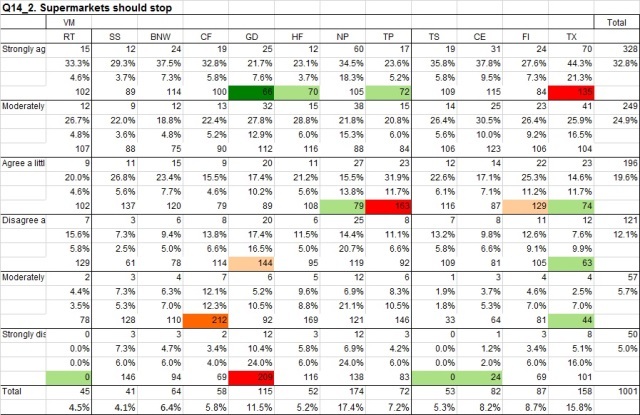 At the more detailed Values Modes (VM) level, the only two VM’s over-indexing on a ‘strongly’ option are the (TX) Transcender Pioneers, the ‘leading edge’ VM in terms of initiating change on ‘strongly agree’, and the (GD) Golden Dreamers on strongly disagree’. But even most GDs ‘agree’ and there are vastly more strongly agees overall (32.8%) than strongly disagrees (5%). 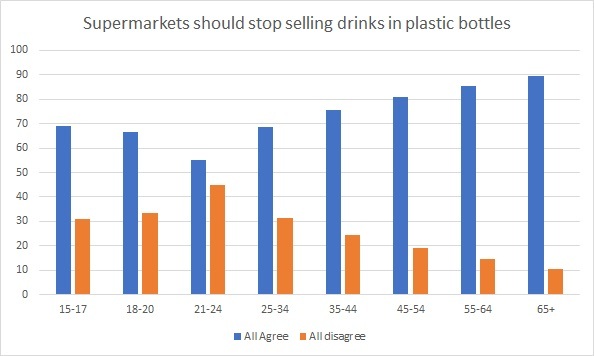 As with the phase-out question there was a significant skew to females being more supportive of a ban, although overall both sexes are in favour of supermarkets stopping selling drinks in plastic bottles. There is some class difference with ABs most keen on a ban and Ds least enthusiastic but overall all social classes support supermarkets ending sales of drinks in plastic bottles. 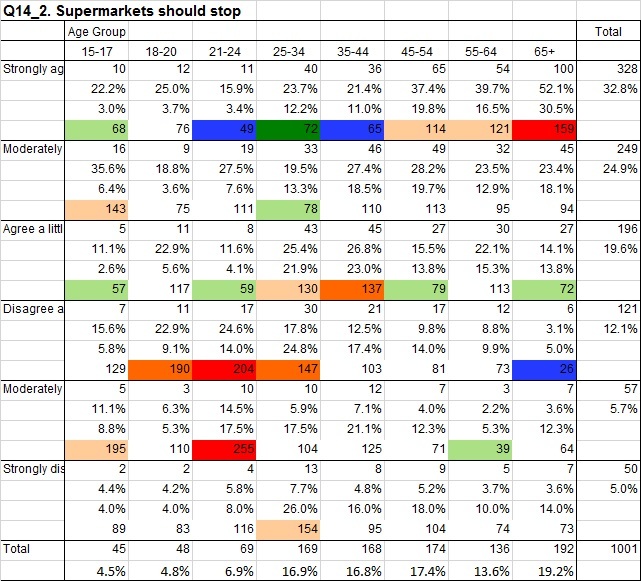 Older people dominate the ‘strongly’ agree option. 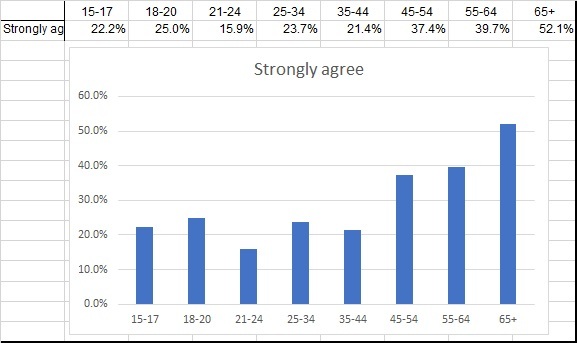 52% of the over 65s strongly agree whereas only 16% of the 21-24 year olds do so. I haven’t seen age related data for purchase of drinks in plastic bottles but it seems likely that this difference reflects consumer behaviour. A ban on supermarket sales of drinks in plastic bottles, voluntary or otherwise, looks as if it would have wide and deep public support.